In the same pan roast rava till it starts changing color to golden ,you can feel a nice roasted aroma. Remove and spread on a platter and allow to cool a bit. Add the rest of the ghee into the pan and saute the pineapples and allow it to cook, stir fry continuously for about four to five minutes. Add half a cup of sugar and mix.Allow it to caramelize and saute till all the liquid is absorbed. Pour in the warm milk and water and add food color and then slowly add in the rava. Spread out evenly. Mix well to avoid lumps and close lid just for a few seconds.Remove lid and continuously stir till water evaporates and add sugar ,cardamon powder and a few drops the ghee. Stir till it the mixture leaves the edges of the pan like a halwa .Garnish with raisins. Switch off the flame and close lid for a few more seconds.Grease plate with ghee and spread the mixture and let it get set and cool down and cut into desired shapes. wow they look so cute!!! 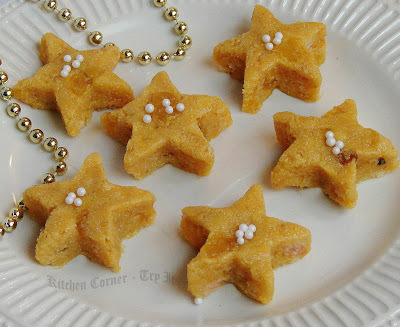 love pineapple flavor.. those stars look so cute. Cute and pretty shape !! Kesari looks delicious !! Adipoli pineapple kesari Love it suja. I have to make it. Wow! very cute and delicious kesari. this is one of my favourite dessert. easy yet so delicious. Well presented & looks delish!! how come i missed this post. looks yumm Suja and love the combo very much.. looks delish. Loved the presentation.. Yuummy recipe..